Beirut: The capture of Eastern Ghouta is a significant milestone for Syria’s regime and paves the way for government troops to shift south to where the seven-year uprising first began: Dara’a. After retaking Eastern Ghouta from the rebels, President Bashar Al Assad now has forces ready to redeploy elsewhere in the war-ravaged country. The rebels that hold the northwest province of Idlib remain a threat, but analysts say Al Assad’s priority will likely be the southern province of Dara’a, where protests against his rule first broke out in 2011. 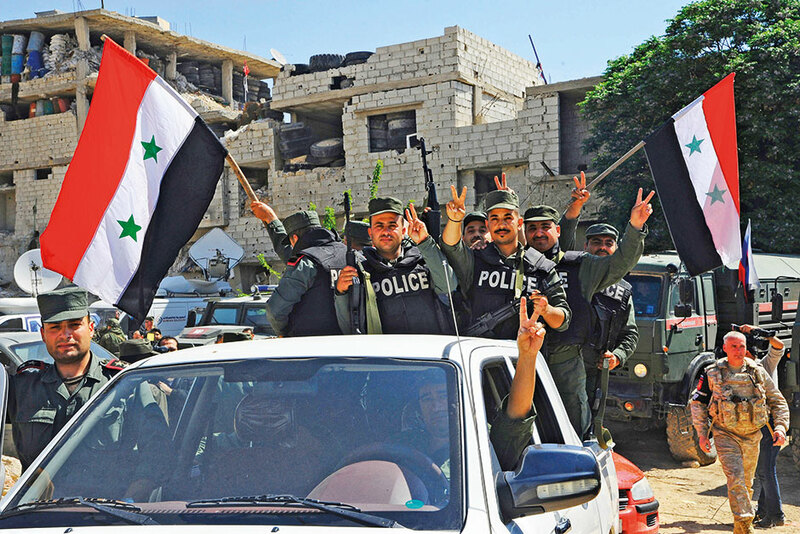 After losing swathes of territory to rebels, Syria’s army has regained control of more than 55 per cent of the country with crucial help from its ally Russia, according to analyst Fabrice Balanche. Its most recent victory is in Ghouta: the onetime rebel bastion that has now been neutralised after a blistering air and ground assault and the Russia-brokered evacuation of thousands of rebels and civilians. “The liberation of Eastern Ghouta means lifting the security and military threat posed to Damascus,” said Bassam Abu Abdallah, who heads the Damascus Centre for Strategic Studies. “After Ghouta, it’s likely the Syrian government will head south - the current situation in Dara’a must be finished off,” he told AFP. The regime said it had retaken Eastern Ghouta on Saturday after a nearly two-month assault that killed more than 1,700 civilians and the evacuation deals that saw rebels and civilians bussed up to northern Syria. With Ghouta now taken care of, the only risk posed to Damascus stems from a few southern districts still held by Daesh, including the Yarmouk Palestinian camp. Al Watan newspaper, which is close to the government, said the army will seek to “finish off” those districts, but analysts believe the regime’s real interest lies elsewhere. “Maintaining some Daesh pockets serves the regime’s narrative in order to reconquer the rest of Syrian territory,” said Julien Theron, a professor at the Paris Institute of Political Studies. He said the regime could redeploy troops to reinforce other fronts against rebels, including Dara’a which he described as a “real problem”. The vast Dara’a province lies south of Damascus and also shares borders with Jordan and the Israeli-occupied Golan Heights. Rebels, backed by the United States and Jordan, hold nearly three-quarters of it and parts of the provincial capital, also called Dara’a. “The regime has been focusing on Dara’a province for a long time, trying to break through rebel territory to reach the city,” said Theron. “Rebels control Syria’s southern border, which has undermined the regime’s image of being the master of its own territory,” he added. Retaking the Nasib border crossing with Jordan, held by rebels since 2015, is a particular prize as it could bring financial rewards for a cash-strapped regime. In the past, the crossing has been a key transit point for trade between Syria, Jordan and the countries of the Gulf. But analysts also say Al Assad’s regime will have to avoid any escalation with Israel. “The areas in the south of Syria are particularly sensitive because they are located between Damascus on the one hand, and the Jordanian and Israeli borders on the other,” analyst Sam Heller said. “Any military action could affect the national security of the three countries,” said the researcher at the International Crisis Group. Thomas Pierret, a Syria specialist at the University of Edinburgh, said Dara’a was the obvious next step for the regime after Ghouta, over Idlib. Al Assad has repeatedly pledged to recapture “every inch” of Syrian territory lost to armed groups since 2011. And while Idlib is surely in his sights, analysts said the province’s complex dynamics could put it further down his priority list. Idlib is held by an array of rebel and Islamist militant forces that have at various times united or fought each other in battles for influence. Taking such forces head-on could prove too costly for Al Assad’s army, said Theron. Furthermore, Idlib lies on the border with Turkey and has been the subject of negotiations between Ankara and Moscow, said Heller. “Until further notice, Idlib is not one of the Damascus regime’s goals, as it is hostage to global political calculations more than military ones,” said Heller. “Idlib’s fate is linked to what is happening behind the scenes in the agreements between Turkey and Russia,” he told AFP. From Damascus, Abou Abdallah said he expected the same tactic used to seize Ghouta will apply to reconquer Dara’a and Idlib: “military pressure to reach a settlement, or settlement without military pressure”.